Doctor Giuliano Poser is credited with helping the star control violent urges to be sick before games. LIONEL MESSI “CRIED tears of frustration” in his battle to beat vomiting urges and muscle problems, says the Italian doctor who claims he revamped the Barcelona striker’s lifestyle to maintain his superstar status. Doctor Giuliano Poser, a sports nutritionist who specialises in optimising muscle performance through the use of specific foods, is credited with helping Messi control violent urges to be sick before games. And using the principles of kinesiology — muscle monitoring to access information about a person’s well being — he has also helped the five-time Ballon d’Or winner shake off the niggling muscle issues that had increasingly plagued him in recent seasons. Although the 29-year-old Argentine “struggled to adapt” at first, after regular visits to the clinic in Venice he is now reaping the benefits, says Poser. “I think he even cried tears of frustration,” Poser told Italian newspaper Corriere della Sera on Friday. 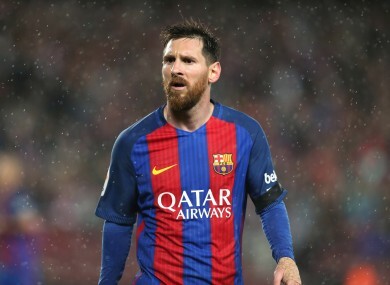 Poser says he introduced major changes to Messi’s diet, bringing in organic and seasonal foods. Those were just the final touches to a “completely new lifestyle”, he claims. “It’s not just a case of changing diet,” said Poser, who has also worked with footballers from Serie A sides Udinese and Palermo during a 30-year career. We live in a time in which foods contain too many contaminants and that can be seen in energy levels when measuring resistance and recovery. “You don’t become a professional player, and even less a phenomenon like Messi, just for the things you eat. “Messi can still be Messi. But he has been intelligent because he wants to maintain his current level. He’s not happy to be one of the 10 best players in the world. He wants to be number one. Messi began seeing Poser over two years ago, although it has taken time for him to benefit. In April last year Messi endured a noticeable rough patch, going five games without scoring — a long stretch by his sky-high standards. What was supposed to be his final visit to Poser’s clinic last week comes days before Barcelona face Juventus in Turin for the first leg of their Champions League quarter-final on Tuesday. Poser, however, can’t give the Italian champions inside information on Messi. I don’t know what kind of relationship we managed to develop because neither of us could speak the language of the other,” he said. Email “Italian muscle man comes to Lionel Messi's rescue”. Feedback on “Italian muscle man comes to Lionel Messi's rescue”.